This workflow will teach you how to use distributed server-based processing on Portal for ArcGIS to analyze multispectral data with an infrared band to highlight vegetation. You will learn how to chain raster functions together to process imagery to extract vegetation and symbolize the result. In this section, you'll create a raster function template. Once you create the template, you can customize it to allow for parameterization. Open ArcGIS Pro and create a new project. On the Insert tab, click New Map. Add the multispectral image you want to analyze. Make sure the multispectral image you add to the map has a red band and an infrared band. Also make sure that the portal you are going to use has access to this image. On the Analysis tab, click the Raster Analysis gallery and choose Raster Functions. The Raster Functions pane appears. In the Raster Functions pane, click the menu button and click Create New Template. The Raster Function Editor opens, which is empty. In the Raster Functions pane, click the System tab and search for the Band Arithmetic function. Drag and drop the Band Arithmetic function into the Raster Function Editor. Search for the Remap function and the Attribute Table function. Drag and drop them both into the Raster Function Editor. In the Raster Function Editor, click the Add Raster Variable button to add a new raster variable. Connect the Raster Variable to the Band Arithmetic function. Connect the Band Arithmetic function to the Remap function. 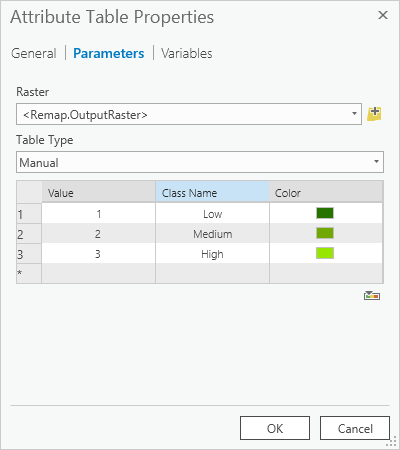 Connect the Remap function to the Attribute Table function. You have just created a raster function template. Now you'll set up the parameters. In this section, you'll identify the parameters in your raster function template that an end user can modify. In the Raster Function Editor, right-click the Band Arithmetic function and click Properties. On the Parameters tab, set the Method to Modified SAVI. On the Variables page, check the IsPublic check box for the Raster and BandIndexes parameters, and click OK.
Right-click the Remap function and click Properties. On the Parameters tab, enter the values in the following screen shot into the table, and click OK. These values are specific to the image you are analyzing and may need to be adjusted to extract vegetation from the image you are using. Right-click the Attribute Table function and click Properties. On the Parameters tab, change Table Type to Manual and enter the values in the following screen shot into the table, and click OK.
Click the Save button. On the Save Template dialog box, type Vegetation Analysis for the name. Choose Custom for the Category and Custom 1 for the subcategory. You have just created a raster function template that analyzes multispectral data for vegetation and symbolizes the output with three values for low, medium, and high vegetation. Next you'll see if the values are accurate for the image you want to analyze. 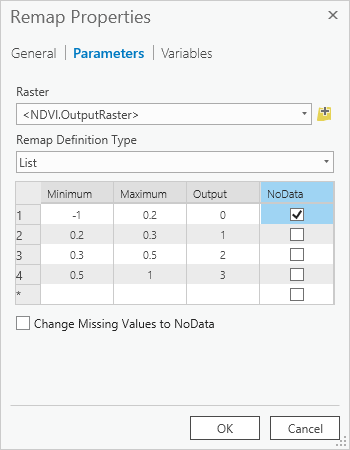 In this section, you'll learn how to test the validity of your raster function template. You'll test the raster function template on a small portion of the image, and the processing will be performed locally. Zoom to an area on the image that is a good representation of the vegetation you want to highlight. You'll now apply the Vegetation Analysis template you just created locally to see if the results are correct. In the Raster Functions pane, click Custom and expand Custom 1. This is the subcategory where you saved your template. Click Vegetation Analysis to open it. On the Parameters page of the Raster parameter, use the drop-down box to select the image you added to map. Enter the indexes of the near infrared and red bands of the image separated by a space. From the Output Layer Type drop-down box, select Raster Layer, and click Create new layer. This creates a new layer that performs a vegetation analysis of your input image on the fly, processing only the pixels you see at the display resolution and gives you a quick result. Verify that the result looks correct. If the vegetation is not correctly analyzed, right-click the Vegetation Analysis template in the Raster Functions pane and click Edit. The Function Editor opens, allowing you to adjust your parameters. Right-click the Remap function and click Properties. On the Parameters tab, change the Minimum and Maximum values for the rows to adjust the values that represent low, medium, and high vegetation. Keep in mind that the maximum value is exclusive, so the minimum value for the next row should be the same as the maximum value for the previous row. This ensures values are not lost when reclassifying. Click Save and close the Function Editor. Repeat steps 2 through 8 as necessary to adjust the values to highlight the vegetation in your image correctly. Now it's time to analyze the entire image at full resolution and full extent using raster analysis in Portal for ArcGIS. In this section, you'll take the raster function template that you have tested and apply it to the entire image at full resolution. The processing will take place in your portal. On the Parameters page of the Raster parameter, use the drop-down box to select the image you added to the map. Enter the indexes of the near infrared and red bands of the image separated by a space. From the Output Layer Type drop-down box, choose Web Image Layer, and click Next. On the Output Generation page, provide a name and location for your output. The default location is the root folder for your portal. Also provide a description and tags for the output web image layer item. Under Sharing Options, determine which users can view this item and click Run. The Raster Analysis Jobs section appears in the Raster Functions pane, providing you with details and messages about the job you just submitted. Once the job is successfully completed, the output changes to a hyperlink. Click the hyperlink to add your output to the map. Verify that the output highlights the vegetation in your image correctly. You have just performed raster analysis in portal to analyze vegetation in your image.